Willow has a home! 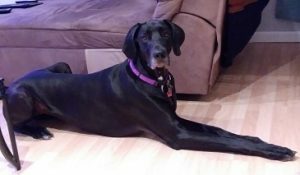 - Rocky Mountain Great Dane Rescue, Inc.
Willow has a home with her foster family in Aurora CO! Beth brought Willow into her home as a foster and just couldn’t see letting her go! This is Beth’s second Great Dane, and being the only pet in the home, Willow will enjoy getting all the back rubs, ear rubs, and snuggle time she can stand! We couldn’t be happier for her, and her new family! Way to go sweet Willow!